Figure 1. A small (typically < 4-cm length) incision is made over the carotid bifurcation, which has been identified by B-mode ultrasound. Figure 2. The eversion endarterectomy technique. 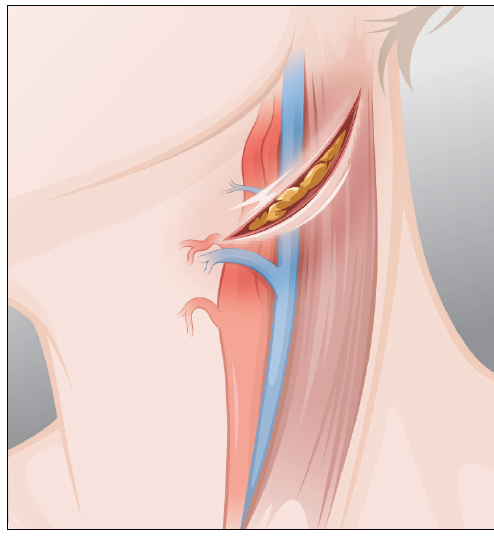 After proximal and distal control have been obtained with atraumatic clamps, the ICA is disconnected from the carotid bulb with an oblique arteriotomy (A). The ICA is everted, and the plaque is removed (B). The arteriotomy on the CCA is extended proximally (C). If the ICA is redundant, it can be shortened. Endarterectomy of the CCA and ECA (D). 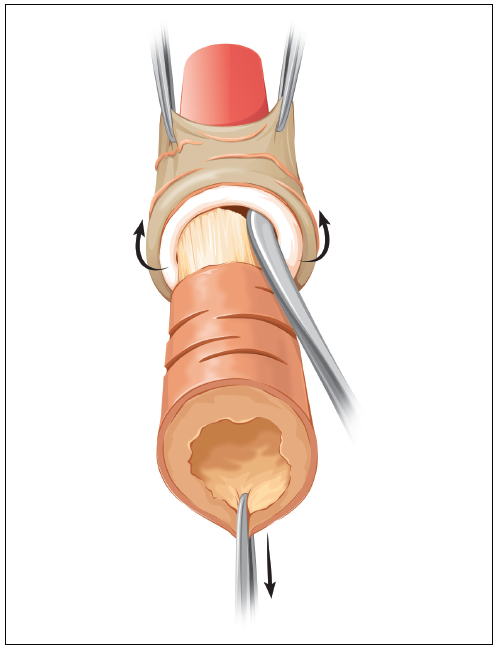 The ICA is reconnected to the carotid bulb with continuous polypropylene sutures (E). Figure 3. Management of the distal endpoint. 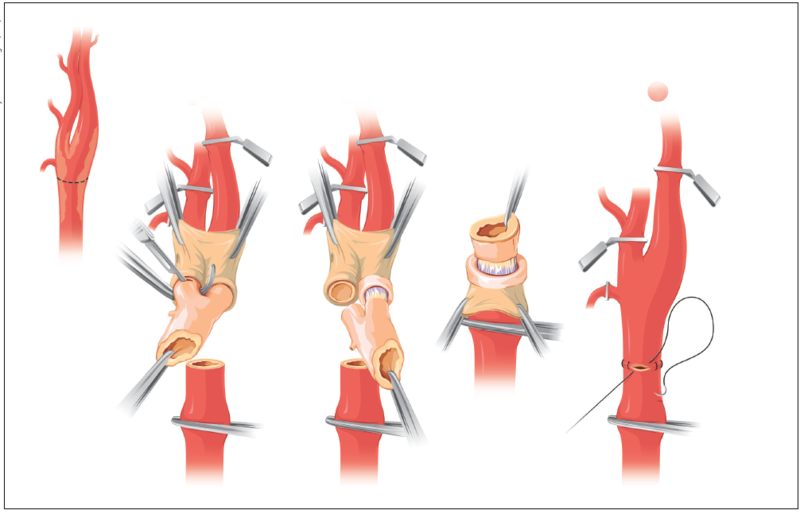 Figure 1, Figure 2, Figure 3, and Figure 4 graphically outline the techniques used in successful eversion endarterectomy. In patients with plaque isolated to the carotid bulb and very proximal ICA and ECA, a slight variation in technique may be performed in which the CCA is transected, as described by DeBakey et al.2 Proximal CCA eversion is performed, along with simultaneous eversion of the ECA and ICA; division of the superior thyroid branch of the ECA may be required to facilitate eversion. In my experience, anatomy conducive to this technique exists in < 5% of cases. Figure 4. In patients with plaque that is isolated to the carotid bulb and very proximal ICA and ECA, the distal CCA can be transected, and proximal and distal eversion can be performed. Many studies have compared standard and eversion techniques for CEA. The EVEREST trial compared the two methods in a randomized, prospective study published in 2000.6 Over a 2.5-year period, 1,353 patients were randomized to undergo eversion (n = 678) or standard (n = 675) CEA. The incidence of ipsilateral stroke was 3.3% in the eversion group and 2.2% in the standard group. There were no statistically significant differences in the rate of stroke or death between the two groups (P = .2). At 4 years of follow-up, the cumulative restenosis risk was significantly lower in the eversion group when compared with the standard group (P = .01). 1. Sullivan T. The greatest generation. Ann Vasc Surg. 2014;28:1809-1810. 2. 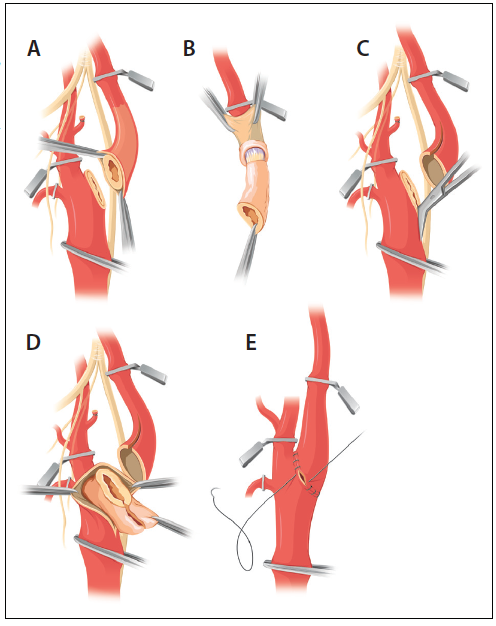 DeBakey ME, Crawford ES, Cooley DA, Morris GC Jr. Surgical considerations of occlusive disease of innominate, carotid, subclavian and vertebral arteries. Ann Surg. 1959;149:690-710. 3. Rosenbaum A, Rizvi AZ, Alden PB, et al. Outcomes related to antiplatelet or anticoagulation use in patients undergoing carotid endarterectomy. Ann Vasc Surg. 2011;25:25-31. 4. Regina G, Angiletta D, Impedovo G, et al. Dexamethasone minimizes the risk of cranial nerve injury during CEA. J Vasc Surg. 2009;49:99-102; discussion 103. 5. Hertzer NR, Bena JF. Patching plus extended exposure and tacking of the common carotid cuff may reduce the late incidence of recurrent stenosis after carotid endarterectomy. J Vasc Surg. 2013;58:926-934. 6. Cao P, Giordano G, De Rango P, et al. Eversion versus conventional carotid endarterectomy: late results of a prospective multicenter randomized trial. J Vasc Surg. 2000;31:19-30. 7. Demirel S, Goossen K, Bruijnen H, et al. Systematic review and meta-analysis of postcarotid endarterectomy hypertension after eversion versus conventional carotid endarterectomy. J Vasc Surg. 2017;65:868-882. Disclosures: Consultant to Veryan Medical Ltd.; meeting organizer for Gore & Associates.